I thought for a few minutes, and then it hit me: Holes in the roof, unstable walls, structure not suitable for a permanent dwelling, easily collapsibleâ€¦ The building inspector hadn’t examined my house. He had examined my Sukkah! At the bottom of the report was a note informing me I had a week to remove it from the premises. 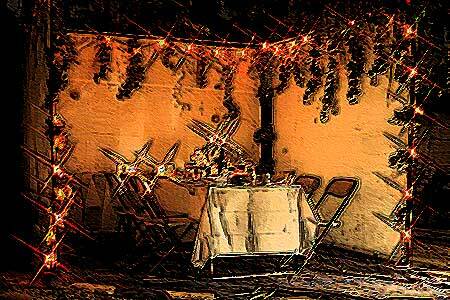 “Well,” I thought to myself, “As Sukkot is a week long Festival, I have time to make the best of this structure before taking it down.” Now there is a tradition of inviting special guests, or in Hebrew, ushpizin, for a meal in the Sukkah. I thought it would be fun to host an eclectic mix of community leaders. So I sent out “computer E-vites” and eagerly awaited responses. Imagine my delight when Moses, Tzipporah, Jonah, and Maimonides all RSVP’ed that they could attend! It would certainly be a Festival to remember. Preparations finished, the big night arrived. The doorbell rang, and I went to greet my first guest. Before me stood a young man whose Mohawk rose at least six inches above his head. There were multiple piercings, and his leather coat smelled like oil. Whale oil. “Yo Rabbi,” he said, “I’m Jonah. I really didn’t want to come. I’m not into authority figures and all that. But I had nothing better to do.” (1) Jonah walked right past my outstretched hand and went straight to my fish tank. He just sat and stared at the water. Tzipporah rolled her eyes and gave me a warm hello. All three came inside. Moses threw his belongings onto the floor, and Maimonides went straight out the back door and into the Sukkah. “Oh, I’m spending the week here,” he answered. I stared at Moses with my mouth open. I looked over to Jonah, who was still staring at the fish. The room grew silent. My four guests all stared at me, and I had no idea what to do. Just then, we heard a voice sobbing from outside. I opened the door to find a young man, probably no more than twenty years old, dressed in colorful rags and quite emaciated. “Can I help you,” I asked as I led him inside. I looked into this poor boy’s eyes and I saw that his heart was filled with hope and dreams. I then looked to Moses, Tzipporah, and Maimonides. Here we were arguing over the structure of the Sukkah and the laws of Sukkot. Yet we had ignored what belongs at the heart of the Festival. 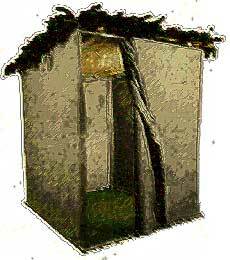 Sukkot is about building order into a world filled with chaos. It’s about a communal journey to strengthen ourselves as individuals and as a people. Our Sukkah is physically open to the outside world, making it impossible to ignore those without shelter. Sukkot reminds us to give structure to our lives, but not a structure so permanent that we can’t question it. While on Yom Kippur, we put ourselves in God’s hands, during Sukkot we take the world into our own hands. And while on Yom Kippur we tear ourselves down, on Sukkot we begin to build once again. I set an extra seat around my Sukkot dinner table, and the five of us enjoyed a true Festival meal. As we read in Ecclesiastes during Sukkot, “There is a time to break down and a time to build up.” (10) Friends, our world has seen enough of breaking down. Yom Kippur in and of itself is about breaking down. Let’s come together to build up, to reach out, to embrace the spirit of Sukkot, and to breathe new life into old rituals. Let us work toward a true “Sukkat Shalom,” a shelter of peace and of wholeness. You see, Sukkot is only partially about building a structure. The true meaning is about building a community. One person at a time. RABBI ROBERT JACOBS talks about Judaism and the notion of a linear time. PLUS: Some of the rituals around the High Holy Days.